For the past few days my blog has been receiving a lot of traffic from a Malaysian online forum, Cari Forum. This is very peculiar because traffic was quite substantial for a website that I have no connections with. On Friday, 7 October 2008 (last week) at 05:02PM, someone posted a picture from my blog onto Cari Forum. 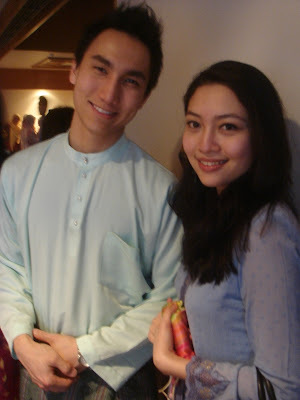 I published the picture on my blog in 2006 under 'My First Raya In Wellington'. The picture was taken in 2006 during the Hari Raya open-house of the Malaysian High Commission in Wellington, New Zealand. The title of the thread on Cari Forum is 'Foto Difoto Terfoto Memoto' with the subtitile 'Thread Foto Selebriti Kesayangan Anda'. With me in this picture is Liz. Apparently someone out in cyberspace thinks that either Liz or me or both of us are celebrities. Thanks for the compliment, dude!